Yes, I know, Ron Paul is as nutty as a fruitcake and has but a small, although boisterous gaggle of followers, small enough that in spite of their overly loud, demanding calls, he never won a single state primary in three tries. But his words also reflect a growing and troublesome attitude in America as more and more, we see people wanting to oppose and disarm our Police Forces, maximizing the rare instances of ‘bad cops’ while ignoring the good most do every single day. Also included in the effort now are claims of “Militarizing the Police,” as if they are being turned into some sort of force designed to turn on and oppress citizens in the country. Just the choice of the word alone shows the effort to denigrate our Police to make them appear as if they are some rogue of armed mercenaries. Too many seem to forget that our local Police and Sheriff Deputies are also our neighbors, maybe even live next door to you and also have families they love. While it is true that Congress authorized turning surplus military equipment over to the Police in the country, cries like from Ron Paul above are more hogwash than anything. I am astonished that Ron Paul, after many years in Congress, doesn’t know the distinct difference between a tank and an armored vehicle. Even if an Armored Personnel Carrier (APC), it is not a tank. 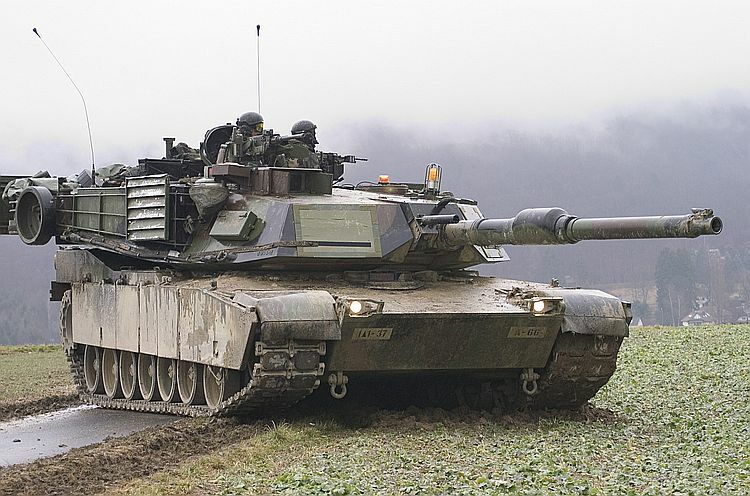 Tanks have large caliber, high velocity guns, and a cannon if you will, on a turret. Some might have rocket launchers. But they have high powered weaponry for use in battle. Armored cars do not have such weaponry, even though in Military use, one might be equipped with a machine gun. 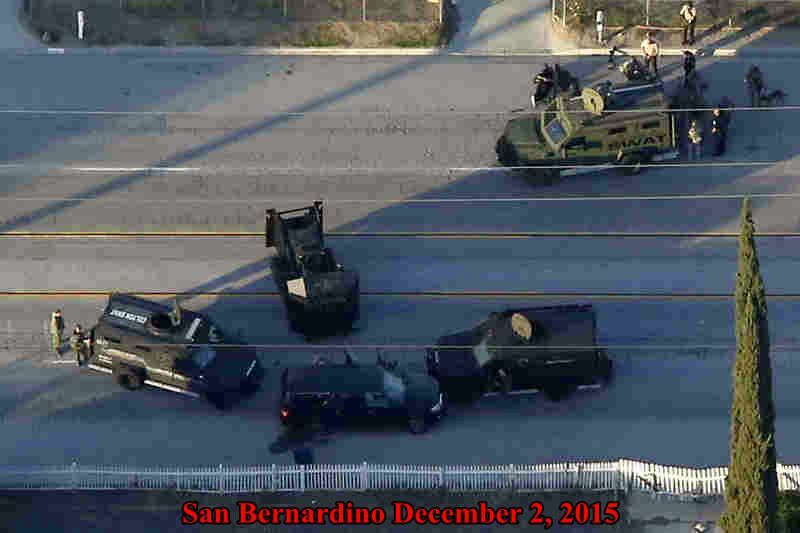 I have yet to see any Police vehicle with a Military Machine Gun mounted on it. And what are those “gases illegal in war time” Ron Paul mentions? Tear gas has been around for decades for Police use in riot control and crowd dispersal. It is nothing new nor is it the gases used in World War One prohibited in use today in war. It is also rarely lethal, ask any Veteran that walked through the gas chamber in Basic Training. One rather ominous sounding claim I have heard is “Police Sniper,” and given surplus Military guns. Of course, using the word “sniper” leaves one envisioning a Police Officer stalking the city from atop a building seeking targets of opportunity and heavily camouflaged to blend in with the surroundings. Sorry, also not something new, but not so much a “sniper” as what some have been called for several decades now, “Sharpshooters,” called in under really dire situations where a finely placed, highly accurate shot might be needed to save many people from a bad guy, likely holding them hostage. These Sharpshooters do not traverse the city seeking targets, but are called on only when a situation might call for their expertise. They are highly trained and only pull the trigger as a last resort and when given the okay by someone in authority. This transfer of surplus Military equipment to law enforcement is due to the Department of Defense 1033 program and has been active since 1997, such transfers first being authorized by Section 1208 of the National Defense Authorization Act of 1990. As you can see, the transfer of such equipment itself is not something new, as some seem to try to convince. It must also be noted that a large amount of the equipment transferred is not weaponry. Office items such as exercise equipment, office equipment, ice machines, medical backpacks, Binoculars and many more items that could make the difference in saving your life in a serious auto accident have also been declared surplus and transferred to local Police & Sheriff Departments. Due to the rioting seen in Missouri and an outcry from the American Civil Liberties Union, the program is currently suspended and under review, the ACLU being among the loudest opponents to the program. Claims are being made of excessive use by Police in SWAT (Special Weapons and Tactics) teams deployed to execute search and arrest warrants. I witnessed one such operation in my neighborhood about four years ago that was executed with precision and no one was injured. Some criminals have no hesitation to shoot Police or innocent bystanders, so I fully understand using SWAT more now than before. And yes, it doesn’t always go off without a hitch, but bear in mind, Police are going in either blind of what is on the other side of that door or relying on intelligence given them. As well trained as these Officers are, and their training is critical, even more so than a regular Officer on patrol, they too want to go home afterwards to their families. Officer Deaton also points out the fallacious arguments and incomplete data often used in condemning the so-called “militarization” of our Law Enforcement Officers. 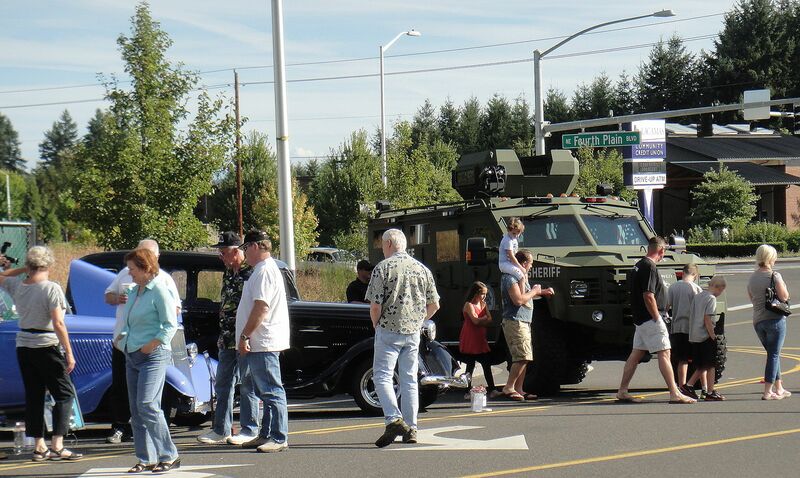 Locally, Clark County has been included in receipt of surplus Military equipment. According to a database compiled by the Detroit Free Press, Clark County received four 7.62 mm rifles (M-14’s) that came into use in the late 1950’s and was replaced by the M-16 in the later part of the 1960’s for use in Vietnam. Several articles have been written and posted on the PoliceOne.com website that gives more accurate background and explains how such equipment has been used and the necessity of it all. A visit to their articles should help you cut through the chaff and loud noises being made by ill-informed journalists and those desiring to further hamper law enforcement as criminals are prepared to escalate crime where they can. And, in case of rioting for any reason or, God Forbid, a Terrorist attack in your community, they are our first line of defense. Consider too, many citizens crying about this so-called “Militarization” also advocate that free citizens be allowed to purchase and own these same weapons under our Second Amendment rights. Yet, they do not want the Police to also have adequate weaponry to use against criminals and bad guys? Our Military is among the finest, best equipped in the world. Contractors manufacture and supply them with the most up to date equipment government agrees to buy. Our tax dollars pay for that equipment and replacements, even to more advanced equipment. That is our equipment, so to speak. When replaced with more modernized equipment, much is still very useful under certain circumstances. Consider for yourselves, where would you prefer that equipment to end up. Sold by the government for pennies on the dollar where it might find its way to the Black Market and in the hands of Gangs, Drug Lords, or even Terrorist groups like Al Qaeda or ISIS? Or in the capable and trustworthy hands of our local Police Forces? Good article Lew. I suppose this question may put me in the camp of tin-hat wearing Ron Paul, but I’m wondering if there’s not a deliberate effort to alienate the average citizen from the police community – especially since many county sheriffs have gone on record saying that they will not enforce laws that impinge on the 2nd Amendment rights of American citizens. Craig, I don’t know who is behind it, but there does seem to be an effort to drive a wedge between our Police and the citizens. The ACLU is really trying to make our county sheriff’s look dirty. Some of it may be because of Joe down in Arizona. His issues with illegal migration… yes I said it that way on purpose because an immigrant does the paperwork and establishes a new home in the new country, have been blasted by Obama for his entire Presidency. This has led to the research of Obama’s background and constant presence in the press of the “legitimacy” of his Presidency question. Lew — I can agree with about 90% of what you wrote. The police are often castigated for many of their practices, and the news media makes a very big deal out of the errors of occasional poorly trained officers — or those few who exercise rather poor judgment. I must note that my father was once an assistant district attorney, and that I have been acquainted with more than an average number of law enforcement officers, including my best friend from high school (who rose through the ranks to a command position in the California Highway Patrol). I’ll also note that I lived in Berkeley (1/2 block from the north side of the U.C. Berkeley Campus) during the leftist “Free Speech Movement” riots/demonstrations in the late 1960s. I had the dubious pleasure of finding my home within a perimeter “protected” by members of the National Guard (standing in a continuous line, one solider every 3 feet, surrounding the campus and all properties one block outside the campus boundary. I have seen true “militarized” police action from a very close perspective. It is important to understand, that I did support the forces seeking to restore order and I had no agreement with the lefties who were fomenting civil unrest. Subsequently, the “War on Drugs” did institute some rather troublesome practices. 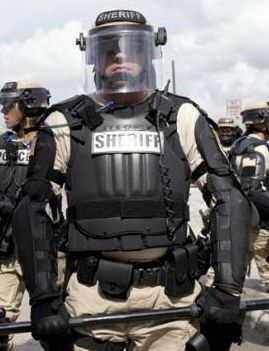 The use of SWAT teams for serving run-of-the-mill warrants when they were originally used only for serious drug house “no-knock” warrants is a terrible (1) waste of police man power and (2) a dreadful reduction in the respect for citizen’s individual rights. Sadly, the bureaucrats, as they’ve gained more and more power over the years, have started to treat the general population as surfs with no rights. We probably deserve this treatment for the failure to vote for those (few) politicians who might defend us from the over the top tendencies of the unaccountable bureaucrats. 90% agreement is pretty good, I’d say. Still, I feel efforts have been made to improve SWAT tactics while we have seen too many times a “run of the mill” warrant service turn into much worse, sometimes with a dead or injured officer, even hostages or other innocents inside the property. Where the correct balance lies is difficult to ascertain as each situation is different. Still, I feel much safer with military surplus going to law enforcement than finding its way to the Black Market and on to the bad guys. I must say that I doubt that the police are using swat teams so frivolously for no serious reason. If you consider the change in the way this nation handles mental health patients vs the old days you will see very poor quality monitoring and much more of these individuals landing in jail. When a person is mentally ill and is acting out the police are more or less forced to respond in a protective mode. Protection of self and of other citizens they swore a duty to serve. If we address the mental health crisis that was created when we dumped all these poor souls onto society we may go a long way at reducing the need for swat teams and being more humanitarian in our care for our more needy brothers and sisters. ” If we address the mental health crisis that was created when we dumped all these poor souls onto society”. We have irresponsible books and movies like “One Flew Over the Cuckoo’s Nest”, and the ACLU to thank for that. People who were once able to get help are now left on the streets. I believe that time period (the early 60s) is when “trial by media” began in the country and has had devastating effects. Now that we’ve transitioned to “trial by mob” things will only get worse. It will be interesting to watch the reaction of the media when they are eventually ‘hoisted on their own petard’. Had I been elected I would have attempted to work on a 4 week crisis triage program where a mentally ill person could check themselves in and get med adjustments under supervision. Meds take about three to four weeks to stabilize in a persons system. Two things would happen… first they would have to take meds while in jail they don’t, and secondly they could be kept out of jail in the first place which would mean fewer victims and fewer dollars spent on prosecution. Saving money on the one hand should afford the cost of the program on the other hand and all the people benefit from a more mentally stabile society.